Saas Fee is Switzerland’s hidden gem for ski families. Near the more famous Zermatt, this big mountain ski resort in the Swiss south is high elevation with plenty of snow and sunshine, but few crowds. Saas Fee is best known for its beautiful glaciers and the stunning peaks that surround the magnificent valley. It’s also a car free alpine village that provides a truly relaxing family ski holiday. Saas Fee is one of the best Swiss Ski Resorts for snow reliability, slope preparation (grooming) and coziness. Saas Fee is comprised of three ski areas, including Saas-Grund and Saas Almagell, our review is of the main mountain Saas Fee. See Saas Fee ski photos and Saas Fee Ski Videos. 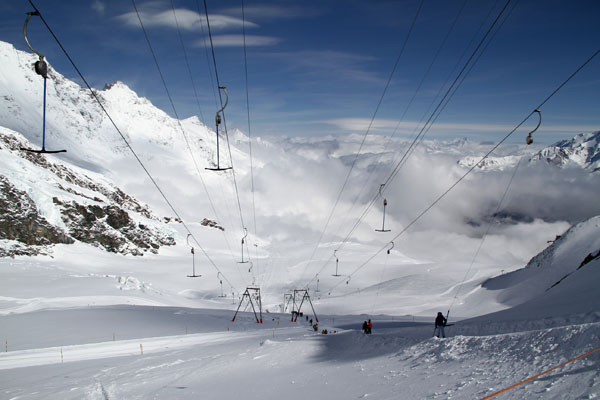 The skiing at Saas Fee includes 21 lifts and 35 long, well prepared (groomed) trails. The ski lifts are a mix of old and new – chairs, pomas, T-Bars, cable cars, and the amazing summit funicular railway to the summit. The Metro Alpin rail brings skiers underground up to the spectacular Allalin Glacier at 11,482′. The crown jewel is Saas Fee’s rotating restaurant, “360” is the highest revolving restaurant in the world. On a clear day, its worth taking your family here for the ever-changing panorama of gorgeous glaciers, and 14,000′ peaks including the Dom, Aletschhorn, Monch, and Jungfrau. From the summit, its a long 5,906′ vertical ski all the way to the village, but there are plenty of other lifts and well-prepared trails to explore along the way. Saas Fee’s terrain is vast and while there is nothing particularly extreme on the trail map, there is lots off piste. Hire a Saas Fee mountain guide to explore, this is glacial territory where crevasses are plentiful and dangerously disguised beneath the snow. As the crow flies Saas Fee is very close to Zermatt and could interconnect, but folks in Zermatt claim they don’t want that. For families, Saas Fee has one of the best ski schools in the Alps – it is British run and popular among families from the UK. Of note: kids under 9 ski free at Saas Fee. Young kids will enjoy Saas Fee’s mascots, and the references to mountain fairies around the resort. Teenagers will love the terrain park at Saas Fee – and the highest percentage of snowboarders in the Alps. Saas Fee’s quaint alpine village of 1,700 residents awaits at the end of your ski day. The peaceful car-free atmosphere (only electric shuttles are permitted for hotels and businesses) adds to the alpine charm and calm. Saas Fee has a few dozen luxury hotels like The Dom, plus numerous chalets and apartments for rent. Walking the picturesque ski village is a delight, its compact and cheery with a pleasant assortment of shops and Swiss restaurants for a delightful ski holiday. For après ski family fun, Saas Fee’s Adventure Park offers snow tubing and a mountain coaster called “SaasFeeblitz”. Saas Grund has a wild 11-kilometer sledge run, among the longest sled runs in the Alps. During winter holidays, Saas Fee hosts fairytale walks – called Mountain Magic, torch light hikes, and even night sledging. Saas Fee’s sparkling glaciers and big mountain skiing are amazing. Saas Fee has the Swiss charm and high elevation scenery of other ski resorts in the Alps but not the big fame. The hospitality of the locals living on this land for 1,000 years is as genuine as it gets. “Saas Fee” translates to meadow of the cows. Arriving by bus or car, you leave your car and cares behind, and immerse yourself in this valley of natural splendor. Travel to Saas Fee: Fly into Geneva or Zurich, take a Train to Visp, then a 40-minute Bus.